Subscribe to and review the Marketing for Owners podcast, and we’ll send your choice of a new book from our book list, delivered for free anywhere in the world. The list includes most of the best books on marketing, all reviewed and recommended by us. Subscribing to the podcast is free. New episodes will be automatically downloaded to your iTunes or smartphone as they’re released, so you’ll never miss a show. Follow the instructions below to get your book. 1. To subscribe, start by clicking here to visit the podcast on iTunes. 2. 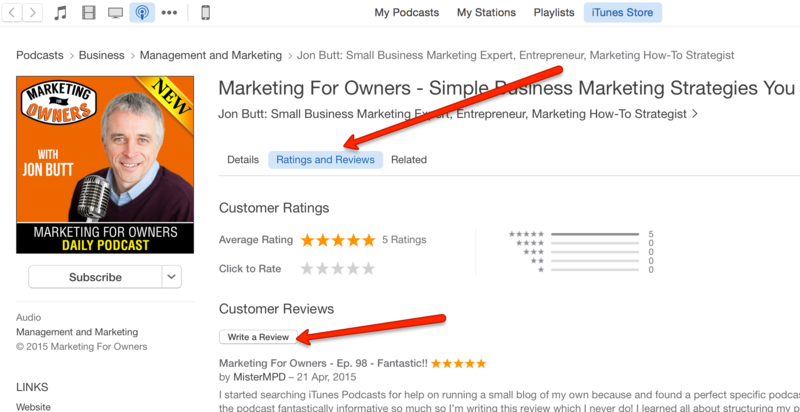 On the left side of the podcast webpage, click on the blue “View in iTunes” button. 3. If you don’t have iTunes already installed, you’ll be prompted to download it. iTunes is free and compatible with Mac, PC, iPhone and iPad (and we recommend it highly for listening to podcasts). Follow the prompts to install. 4. If you do have iTunes installed, you may be prompted to confirm that you want to launch iTunes. Click Launch application to continue. 5. 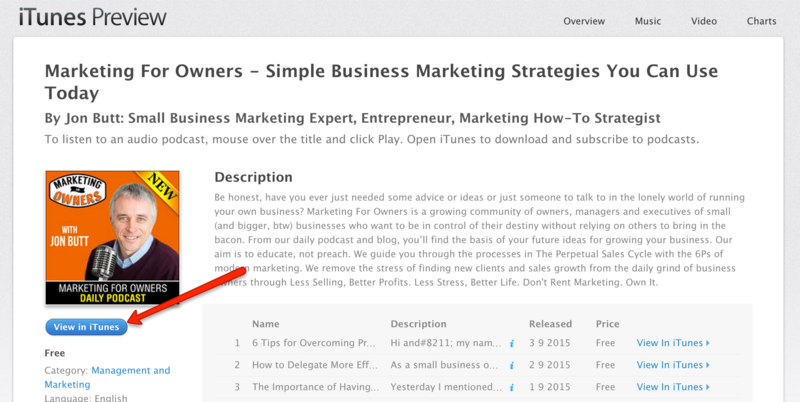 Once you’re on the podcast page on iTunes, Click on the Subscribe button. 6. Next, listen to an episode and leave an honest review in order to receive your free book. 7. Finally, as our way of saying thank you, we want to give you a free book. You can select any book from the list on our recommended books page. We will then order a brand new copy and have it sent to you at any address in the world, for free. The book will come from Amazon or Book Depository (owned by Amazon). Please fill in the form below (scroll down below the image). Make sure the details are correct so your book arrives safely. Your address will not be used for any purpose other than sending your book.